The Four Seasons Centre for the Performing Arts is a 2,071-seat theatre in Toronto, Ontario, Canada, located at the southeast corner of University Avenue and Queen Street West, across from Osgoode Hall. The land on which it is located was a gift from the Government of Ontario. 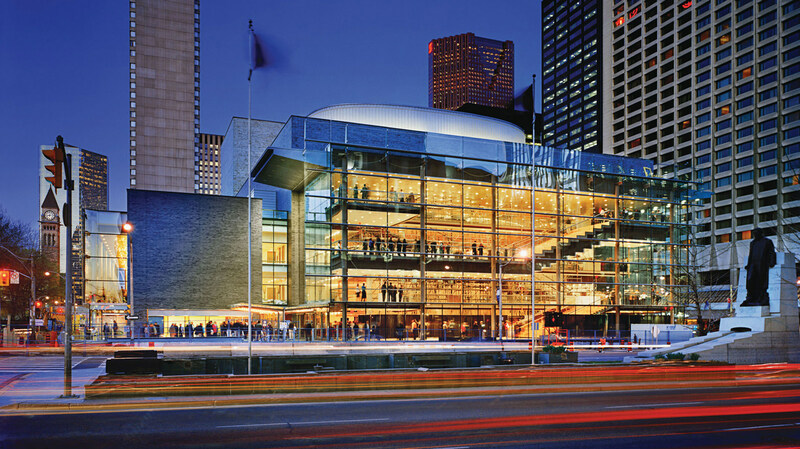 It is the home of the Canadian Opera Company (COC) and the National Ballet of Canada. After various setbacks from the 1980s onward, attempts by the COC to find a new permanent home led to the company issuing an invitation in 2002 for designs. Ten architectural firms submitted proposals and, from them, the Canadian company Diamond and Schmitt Architects, headed by Jack Diamond, was selected as the winner for its modernist design. The Centre had its grand opening on 14 June 2006, with regularly scheduled performances commencing on 12 September 2006 with the inaugural production in the new opera house being Richard Wagner’s epic tetralogy Der Ring des Nibelungen (The Ring of the Nibelung). Governor General Michaëlle Jean and numerous other Canadian luminaries attended the event. Three complete Ring Cycles were performed in September 2006.